Although posted today, this UK DEFRA (Department for Environment, Food & Rural Affairs) report is current through the 22nd of July, and therefore does not include the 80th outbreak I reported on yesterday. Since the last update on the 18 th February, several new outbreaks in poultry have been reported as a result of increased surveillance in South West France (see map – only recent outbreaks shown). To date there are 79 outbreaks of HPAI H5 (N1, N2 and N9) and sixteen outbreaks of LPAI H5 (N2 and N3) which have been reported to the EU Animal Disease Notification System. The most recent outbreaks have been reported this week, one in the Dordogne and one in Aveyron (OIE, 2016). 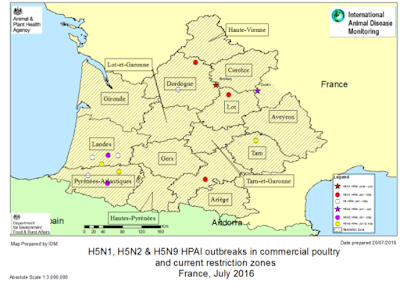 In Dordogne, a broiler flock was exhibiting increased mortality over a period of two days, and has tested positive for H5N1 HPAI. In Aveyron, a flock of fattening, free range ducks tested positive for H5N2 HPAI in the framework of national surveillance. Disease control measures have been put in place around each infected premises including culling all poultry present. The restriction zone (under an amendment to Implementing Decision 2015/2460/EU) has remained in place and not changed as a result of these outbreaks. The French eradication plan which was put in place earlier in the year has finished and farms are being restocked, so these new cases suggest that disease is still circulating or that viral contamination is still present in certain areas. The exports and trade of live poultry, hatching eggs and day-old chicks are carefully controlled from the restriction zone. 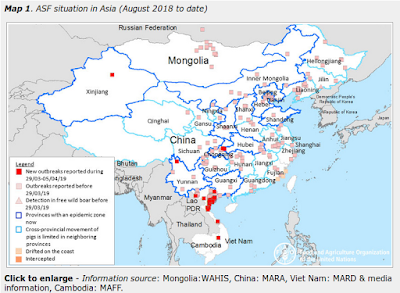 It will be of interest to understand whether the HPAI viruses in these recent outbreaks are closely related to those found in 2015 or if they are new introductions, which seems unlikely, but should not be dismissed until the sequences are known. These recent outbreaks are a setback for the poultry industry in this region, but the French Ministry has confirmed that these results justify the strict biosecurity measures they have put in place in the last eight months because of the high infection pressure present. The risk to the UK has not increased as a result of the new outbreaks reported. We will continue to monitor the situation closely. We would like to remind all poultry keepers to maintain high standards of biosecurity, remain vigilant and report any suspect clinical signs promptly and in addition using the testing to exclude scheme for avian notifiable disease where appropriate for early safeguard.